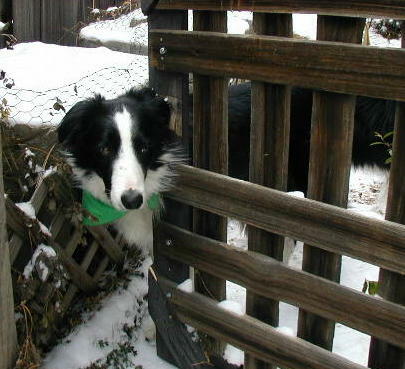 Greetings and salutations, everyone; yes, once again it is I, Mani the purebred border collie, filling in for the guy I live with, and here to bring you the latest news from our very damp garden, and also to bring you a sentimental post. You may remember me from such posts as “A Short, Sentimental Post”, among so many, many others. Here I am in a characteristic pose. It rained again yesterday evening, and I got very wet on my walk. There wasn’t any thunder, which was kind of amazing. The guy I live with suggested we might have entered a portal to another dimension, where it doesn’t thunder every single time it rains, when we walked into the field. It was nice, for sure. 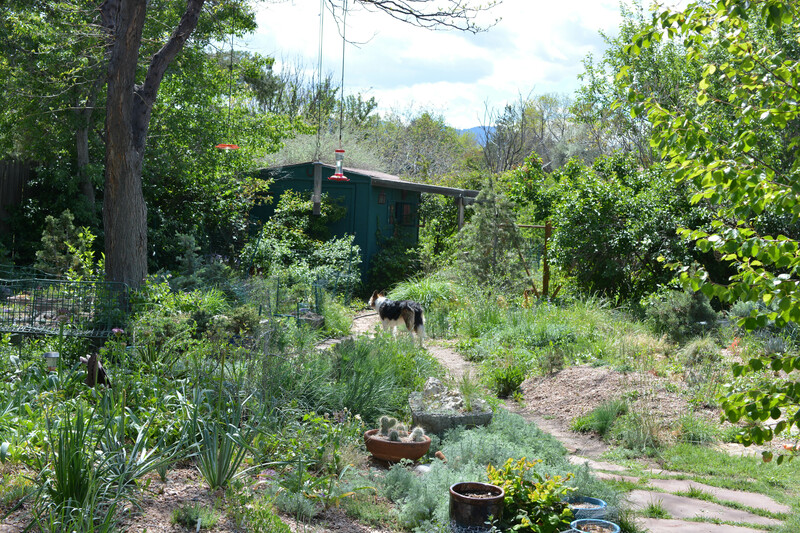 All the rain has made the garden super green. The snow helped, too. You can see the Kentucky coffee tree out in the “way back” hasn’t leafed out yet. It’s those branches sticking up to the right of the shed. 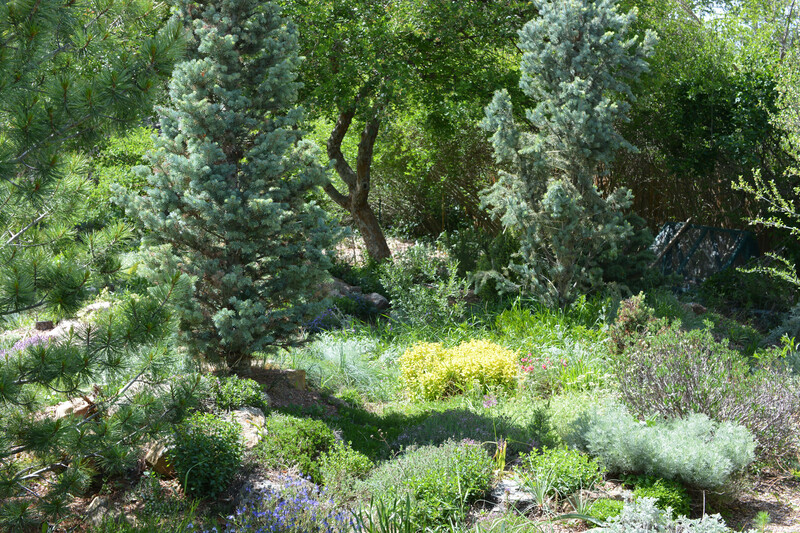 The “old rock garden”, with a view to the Russian hawthorn, with its weirdly-growing branches. The big rose, Rosa kokanica, has started to block the path to the back. 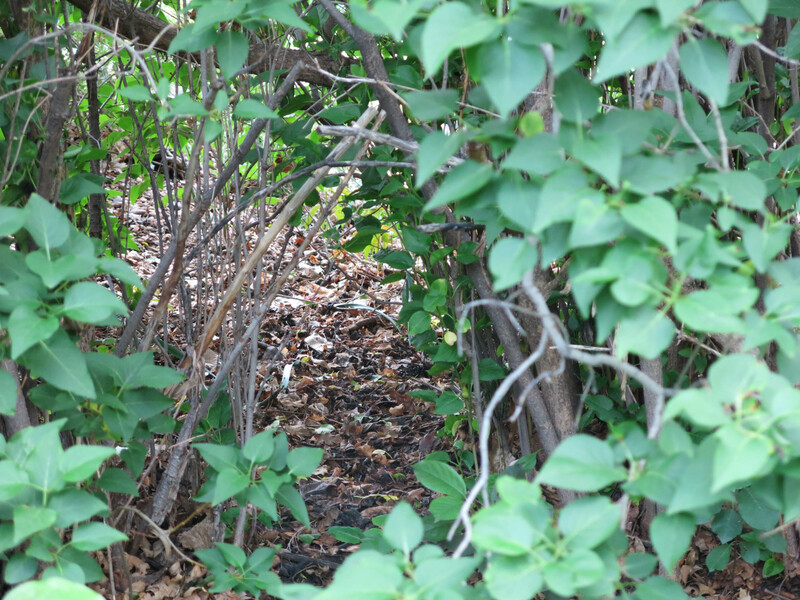 The path is called “Pooka’s Shortcut” because he made it, many years ago. He couldn’t be bothered to run around the rock garden and down the path. (You can see the steel hoop fence on the north side of the path. 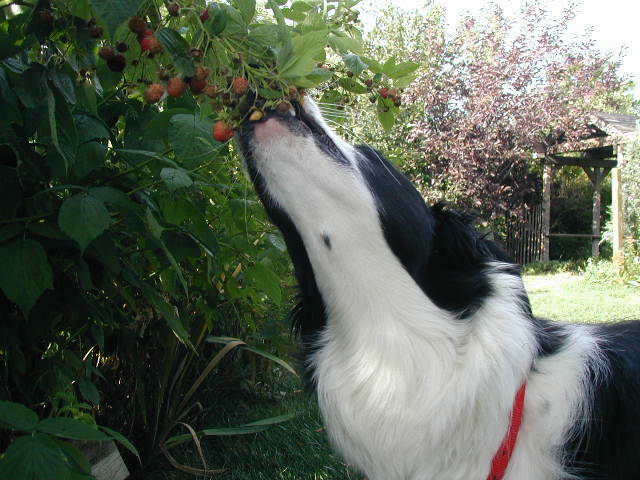 I would agree that that would be too much trouble when there’s stuff that needs to be barked at out in the field.) 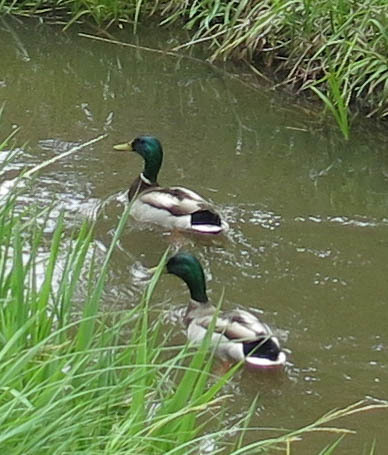 The water was gone from the canal for a few days, which was strange, but now it’s flowing again and the ducks like it. Also, the guy I live with said that a western tanager has been at the oriole feeder for the last two days, and he really wanted to take a picture of it, but it always flies away when it thinks it’s going to have its picture taken. It’s yellow with a red head, so pretty noticeable. As I suggested, this is going to be a sentimental post. I mentioned Pooka’s Shortcut, but there’s another shortcut. This is Slipper’s Shortcut. (I use it, too.) He made this when he and his buddy Chess played hide-and-seek in the garden, which they did a lot. Slipper would use this shortcut to sneak up on Chess. It was kind of cheating, but they both enjoyed it. 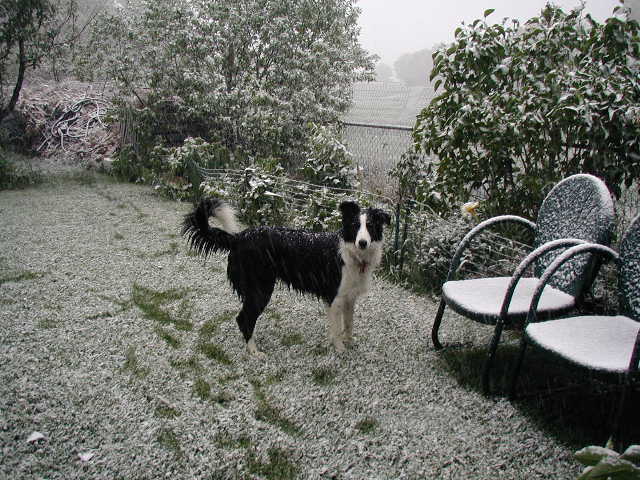 The guy I live with said that the blog has already talked enough about the lady of the house, who died eight years ago tomorrow, and so he thought I should show some pictures of Slipper, who was Chess’s buddy, and who died here seven years ago today. 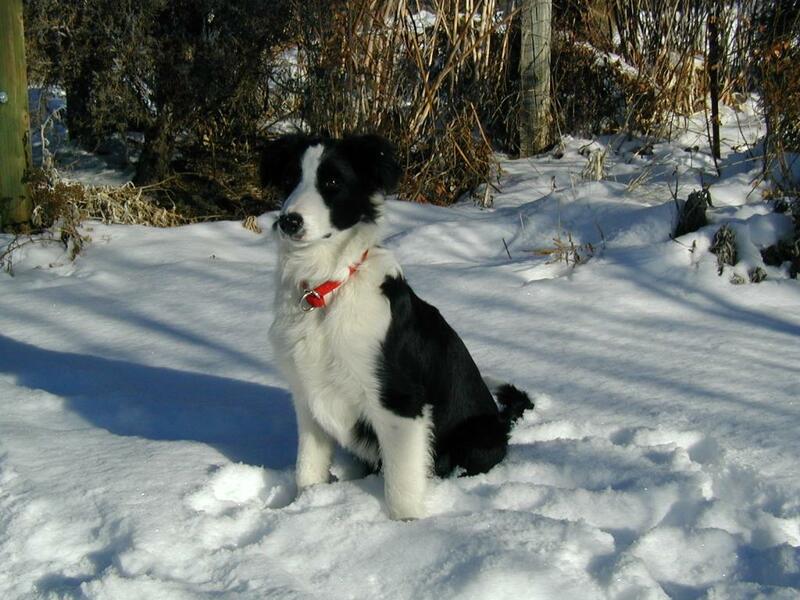 Here he is when he was about six months old. He was named after a character in The Irish R.M. (like Flurry before him was). 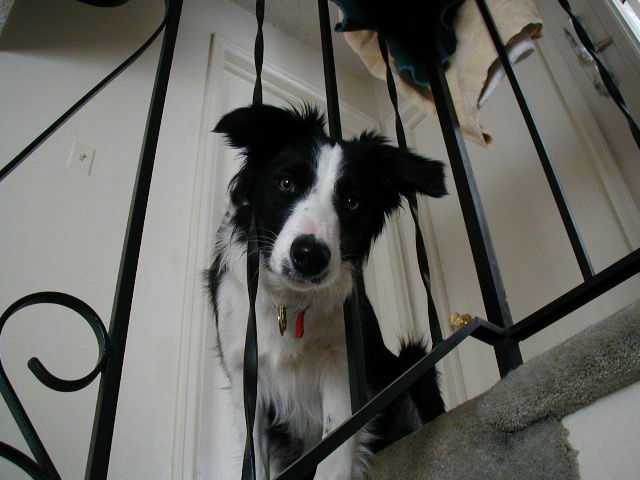 Here he is on the stairs. Probably in his second winter. 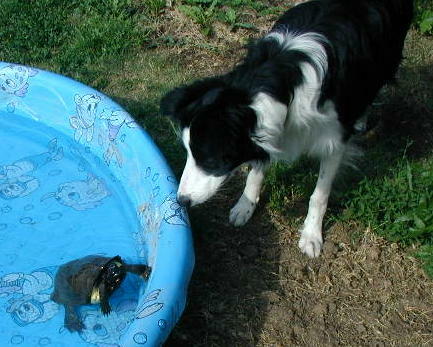 Here he is, meeting the turtle. The turtle was here for a very long time. 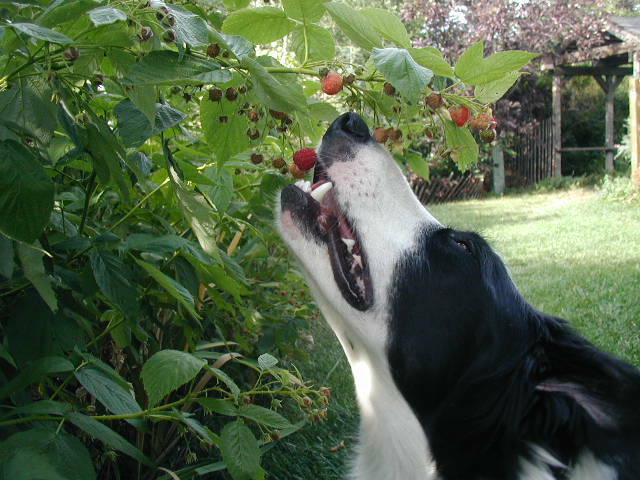 Here’s Slipper learning to pick his own raspberries and eat them. 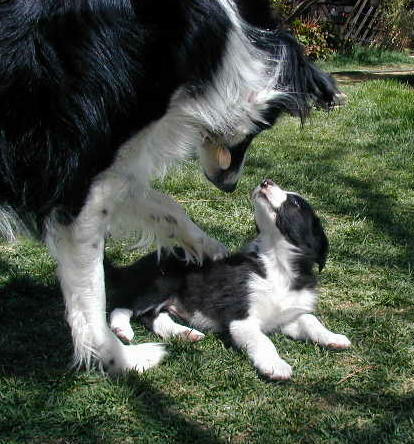 Here’s Slipper meeting Chess, the first day Chess came to the house. Here they are on the couch together. They were first cousins, but also great friends. That’s all I have for today. I hope you enjoyed all the pictures of Slipper. The guy I live with thought it was about time that we did something like that, and it’s been too wet to do much serious gardening here. 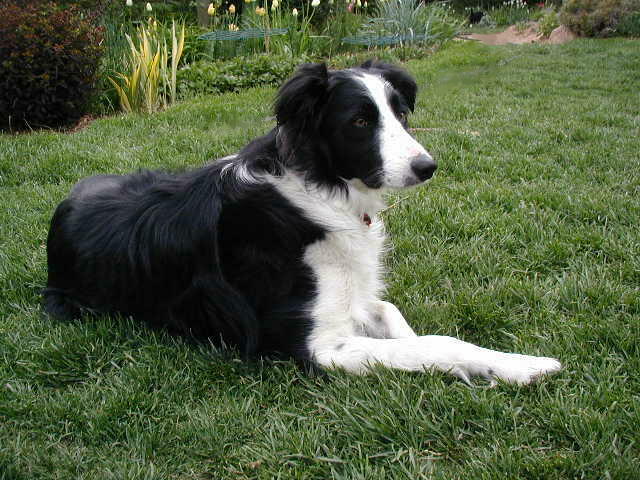 Besides, lots of pictures of purebred border collies are excellent, even if most of the pictures weren’t of me. 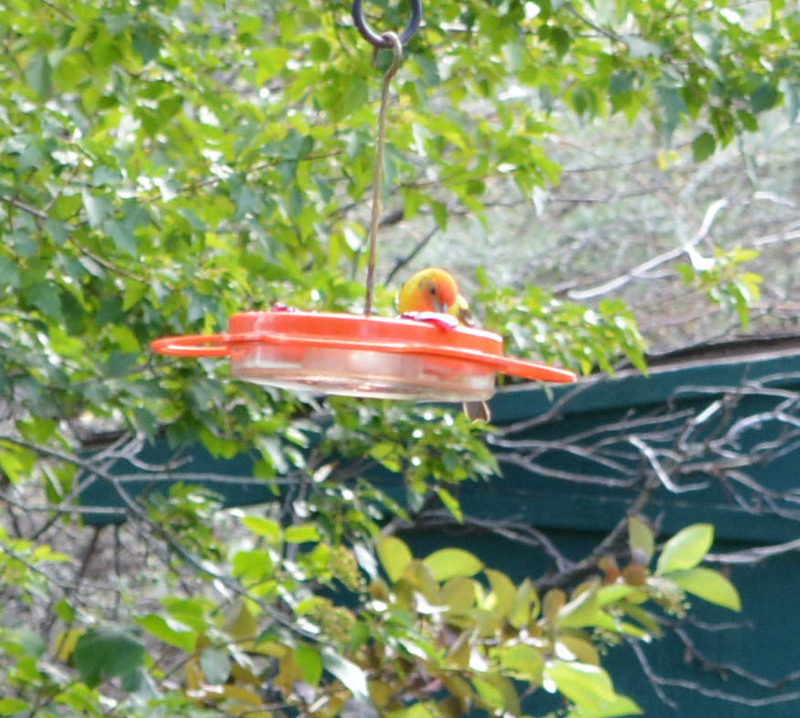 Oh, and the guy I live with did get sort of a tanager picture. 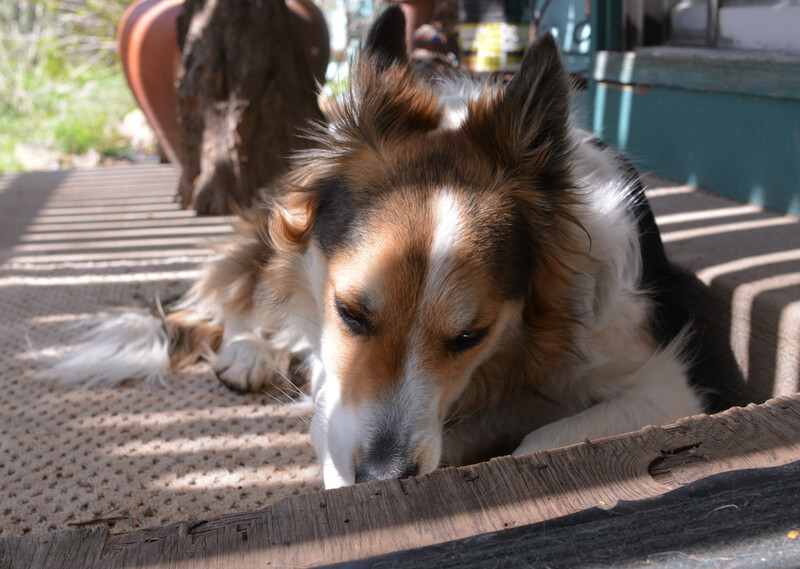 I will leave you with a picture of me, chewing on something, though, just to add to the general excellence. That picture with Slipper meeting Chess! And the one of them on the couch! Very sweet. 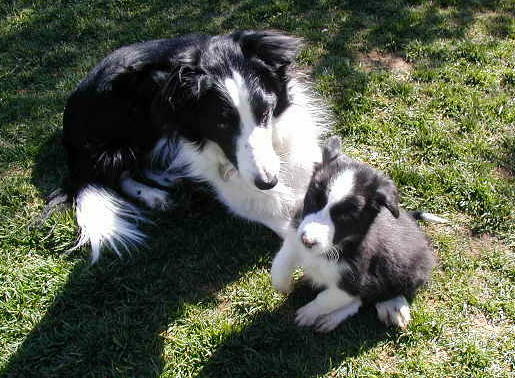 I have so many good memories of them chasing each other around the back yard. Merrilee said she’d forgotten how very black and white they were, now that we’re used to seeing Mani with his patches of brown. Pretty cute, huh? It seemed about time to do a Slipper Post. 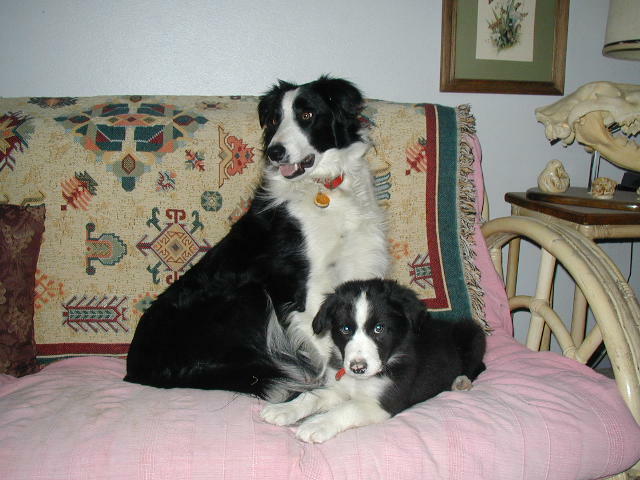 They were both very black and white; the guy I live with says you can see the collar Slipper is wearing, which has that little curl at the end, and which I’m wearing now. Oh, my . Slipper seems an enchanting dog, fun to be around. He certainly was handsome. What a mentor he was to young Chess, the dog so wise and gracious. And the two together! Just plain excellence. 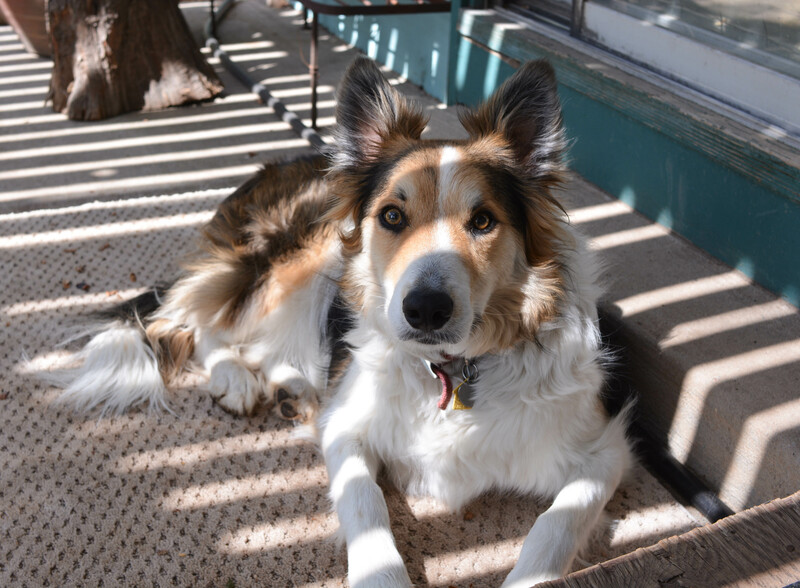 I know another dog now, generous with sharing his predecessors’ photos, who loves his good times and exhibits unique velociraptor capabilities. I am happy, Mani, you are around to keep the tradition of Slipper’s path alive. You too possess a special appealing sweetness. Thanks. I’d have to agree that I’m sweet, except maybe when I’m velocirapting. (Velociraptors have to be tough.) 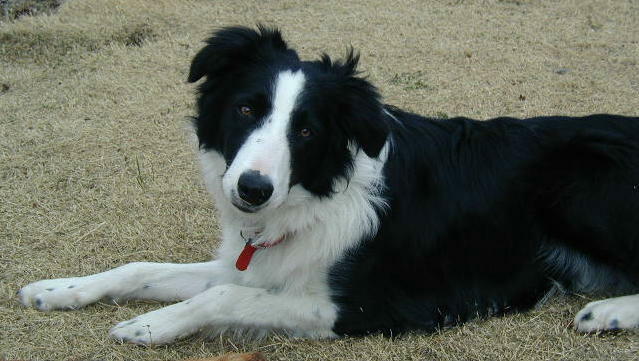 The guy I live with said Slipper was as third again as large as Chess, who was a much smaller purebred border collie. Smaller than me. Slipper and Chess were best buddies, and when Chess came to the house, Slipper’s eyes lit up. Thinking of that gives the guy I live with certain ideas. Oh what lovely pictures. 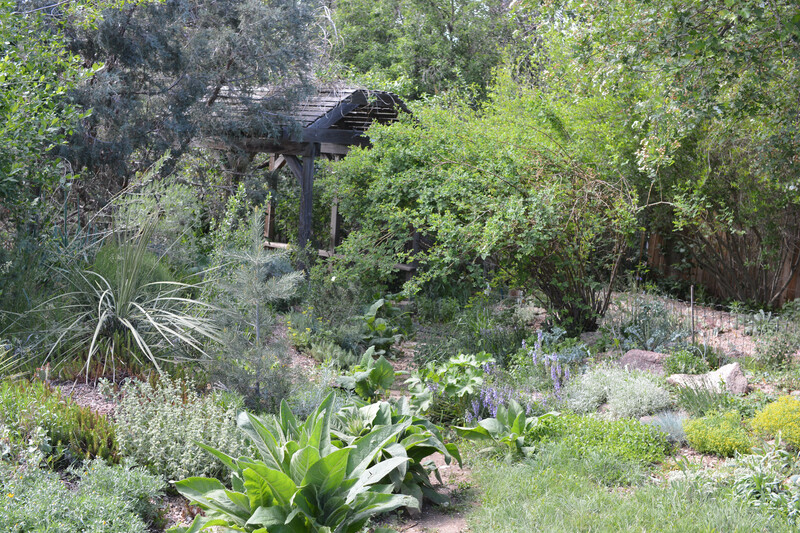 The garden looks beautiful and the pathways make one want to explore. The raspberry eating, the black and white excellence of the past. It’s great (as is black and white and brown). If I may be allowed to say, I don’t think enough can be said about the lady of the house. I am sure I speak for others when I say I love to hear about her and look at her beautiful art. She lives on for those of us who never knew her. Thanks. The guy I live with says the garden looks extra-green because of all the weeds. The field behind us is filled with weeds, and because they mow it, there are more weeds every year, and they “jump the fence” (or go under it) into our garden. The guy I live with, who is sometimes right, says things are bound up with other things, if you know what I mean; he would never have met his friend had he not been happy living with the lady of the house, and he would never have brought me home, either. Even though I wasn’t just black and white. That was like a slight jog in the attempt to achieve some sort of continuity. Yes. I hope to manage that it my recently shattered life. The guy I live with knows what happened. He says he spent most of the time trying to make it from day to day, even hour to hour, sometimes. Most of the things people say are pretty useless. Slipper, Chess and now you Mani…che cani meravigliosi! Un saluto dalle Alpi marittime! Thanks. I guess he was pretty cute. 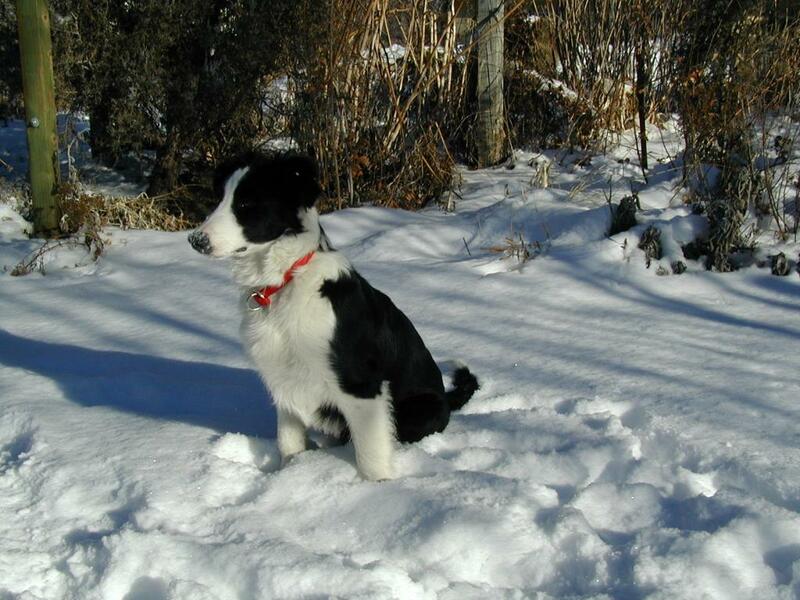 He was a purebred border collie, after all ….